THE STORY - Christopher Robin -- now a family man living in London -- receives a surprise visit from his old childhood pal, Winnie-the-Pooh. With Christopher's help, Pooh embarks on a journey to find his friends -- Tigger, Eeyore, Owl, Piglet, Rabbit, Kanga and Roo. Once reunited, the lovable bear and the gang travel to the big city to help Christopher rediscover the joy of life. THE GOOD - Nostalgic, magical and light. Makes you feel like a kid again. Wonderful for both kids and adults. THE BAD - Maybe a little too light and silly at times. Jokes can be repetitive. ​​​​Winnie the Pooh was first published in the mid-1920’s and was a smash hit almost immediately. Ever since then generations of children have loved Pooh and his animal friends. In addition to the written stories there have also been several films that chronicle the tales of Pooh, but the most recent, “Christopher Robin”, is about the little boy from the stories who was originally based on the author A.A. Milne’s own son. The story the film tells, however, is only about the character Christopher Robin, and not the real person. “Christopher Robin” opens with a glimpse into the background of the characters, complete with beautiful illustrations that are reminiscent of the original illustrator, E.H. Shepard. We see the young Christopher Robin wishing his family of animals farewell before heading off to boarding school and with only a few scenes it establishes the loving relationships at play between Christopher Robin and his friends. Once he heads off to boarding school, Christopher Robin finds himself firmly in the real world with all of its attendant difficulties. In a few well-chosen scenes the film shows us Christopher Robin growing up; he goes through loss, captains a platoon during World War II, finds love in his a relationship with his wife Evelyn and experiences joy at becoming a father when his daughter Madeline is born. The real story picks up as Madeline is approaching the right age to be sent to boarding school, long after Christopher Robin has turned from a fun-loving boy to a serious and dour man who is more focused on his work than anything else. Faced with a crisis at his job and only one weekend to solve the problem, Christopher Robin decides to forgo plans with his family to visit the country and it becomes apparent that this is hardly the first time this has happened. In the midst of this dilemma, we return to the Hundred Acre Wood where Pooh is waking up for the day only to discover that his friends are nowhere to be found. When he goes searching for them he finds a door to the outside world and decides to seek out Christopher Robin to help him find his friends. This simple plan ultimately succeeds and in the process of helping Pooh Christopher Robbins also realizes what is truly important in life. With the success of “Paddington”, it was almost inevitable that Disney would make a new Winnie-the-Pooh film, the only question was how good the end product would turn out to be. 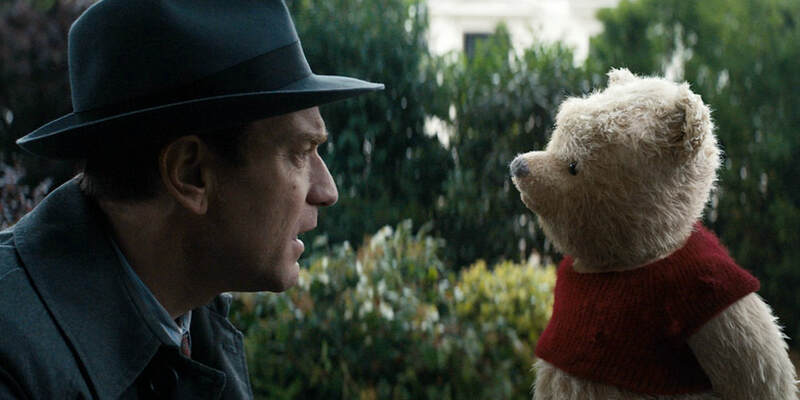 Thankfully “Christopher Robin” manages to stay true to the tone and sentiments of the original stories and the incredibly well done visual effects only add to the appeal. The film eschews the all too common habit of including ironic jokes for the parents in a film made for kid audiences by aiming to appeal to families in general. It discusses concepts such as the difficulty of growing up with the same nuance it gives dealing with an overwhelming task at work or an absent parent. For all these serious ideas “Christopher Robin” never forgets that its ultimate goal is to entertain, and it includes plenty of adorable gags and sweet moments to entice the most cynical of preteens. Great kids films are a rare treat and “Christopher Robin” is a welcome addition to this year's attempts to add to that category. It combines a sweet story with beautiful effects and good acting by an enthusiastic cast making for a pleasant watch that never puts the audience out of their comfort zone. While the film doesn’t break any new ground and maybe a little too saccharine for some viewers it should provide a positive experience for Pooh fans young and old alike.